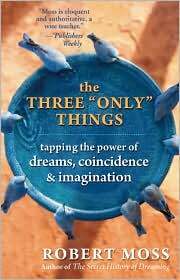 Moss incorporates principles from dream interpretation, coincidence, and imagination (visualization) into one book. He offers up nine rules for dream interpretation and coincidence and seven rules for visualization. Moss offers the reader some guidelines for letting their dreams work through problems and also in changing their lives. He uses good analogies and personal stories to relate his concepts. Rather than providing a list of stereotypical symbols and meanings, Moss encourages the reader to trust intuition in finding the meanings within their own life. Additionally, he discusses how to work with dreams and how to re-enter dreams so the dreamer can discover the meaning behind the dream. In Moss’ discussion on coincidence, he helps the reader to see life’s coincidences and use them to the best of their advantage. His rules of coincidence seem like good clichés “to find our way, we may need to get lost” which can be life lessons. He points out the abundance of symbols around each person; how it is a matter of recognizing them; and that those symbols are personal to the individual. In discussing the use of imagination or visualization, he touches on the core concepts of seeing what you want and then working towards it. This concept is discussed in many books. Moss discusses this topic in a very non-religious manner. He speaks of the energy of the universe and leaves a specific divine force out of the picture. Regardless of the religious affiliation of the reader, they can relate it to the lessons within their own beliefs. While Moss doesn’t present any new ideas concerning the three topics, he does bring them together to help the reader utilize them all at once. He uses stories about his own experiences and those he has coached to demonstrate the concepts he is illustrating. These stories are told in a positive and easy to read manner. He assists the reader in tapping into their own intuition and healing by using dreams, coincidence, and imagination. This is a well written and thoughtful book. Moss combines three concepts into one for the reader to easily access the information in one place. If the reader is looking for a good book to explain these three concepts this would be a good book to start with. This is not meant to be an all-encompassing book; there are no lists of symbols or associations for the reader to look up their latest dream or incident involving coincidence. Moss is a skilled writer and story teller. His anecdotes are personal and relatable for the reader, he clearly outlines the rules for each of the three things. His style is easy to read and clear in the message he conveys. The only issue is there is really nothing new in this book All of these concepts have been discussed endlessly in many books. However, Moss does bring them together into one place.